So you've decided on a hardscaping project at your house. Great, so now what? Who should I hire? Can I trust them? Is the investment worth it? We have developed a checklist of questions and the answers you should expect from a reputable contractor. Price is always a deciding factor with hardscaping projects, but these other aspects are often overlooked. Don't mistake a low price for the right price. You should think of this as a long-term investment in your property because quality landscaping will appreciate over time when done correctly. Without further ado… 5 quick questions to ask when hiring the right contractor. Q: How do you prepare for clay soils? Q: What material do you use for the base layer? How thick is the base? Q: What material is used for the setting bed? A: Washed concrete sand. If they say stone dust, walk away now. Your project will be compromised! Q: What kind of edge restraints do you use? A: Plastic or metal edging with 10-inch (or larger) spikes. No concrete! Q: What do you use to fill in between the pavers? Bonus Q: What kind of warranty do you offer? No warranty signifies the contractor doesn't stand behind their work. If they don’t believe in their own work, why should you? Now if you want to understand what all those questions mean, read through the explanations below. The first thing you need to ask is how they prepare for clay soils. When dealing with clay soils, you need to consider a geo-textile, which gets laid on the soil then the base layer on top. This will provide the proper strength to stop any heaving and settling. You should then find out what material is being used for the base. ICPI standards dictate that 4 inches of compacted QP are necessary for almost all sidewalks and patios. Anything less and you run the risk of the base settling, leaving your pavers uneven. The next step includes the setting bed. Many contractors use stone dust and this is wrong. When using stone dust you are going to get irregular compaction so in time your sidewalk or patio will not be level. Most importantly, brick manufacturers will void the lifetime warranty on their brick if they see that stone dust was used as the setting bed material. The proper material is washed concrete sand. Edge Restraints - Improper edge restraints will allow the sidewalk or patio to fail. The pavers will start to move and shift away from the center of the project. Contractors need to use a plastic or metal edging with a 10-inch spike or greater. You can also use large slabs of stone such as granite or blue stone. Warning: Contractors may use concrete along the paver edge, but it is sure to crack once the New Jersey winter weather arrives. 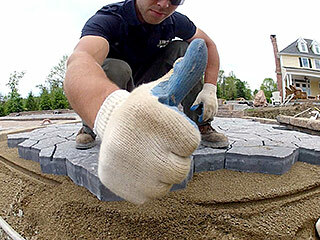 Joint Material - One of the best materials is polymeric sand. This allows some water to pass through the joints while the remaining water will run off of your project. Polymeric sand keeps your pavers locked together, prevents ants from undermining the integrity of your pavers, and adds an aesthetic element that lasts for years. Many contractors will use regular sand to fill the joints, so make sure you find out the specific type of sand. Well there it is! The list what to look for when installing a paver sidewalk or patio. If you have any questions, feel free to give us a call. If you decide to do it yourself and would like recommendations for techniques, suppliers, materials, rental companies, etc, contact us.